I once encountered this (mini) game where you had 4 or more vertical pipes that were connected by a number of horizontal pipes and you have to drop a ball or water into the vertical pipes. Guess what pipe the object will come from. When moving through a vertical pipe the object will turn into a horizontal pipe when possible. Write a program that will create a random grid of pipes(see sample pipes). There should be at least 4 vertical pipes and a fair amount of horizontal pipes at least 10. The length of the vertical pipes is up to you. Show the path that the object took to reach the bottom and show how many turns it took to get there. (Optional) input to deterimine starting point, pipes numbered 1..N from left to right. 14 turns were taken to get to the end. The object enters pipe 1 and starts moving down, goes left into the first horizontal pipe. Back down and into the second pipe followed by a U-turn into the third pipe. shouldnt be in your result but I used this to show you the object could have gone straight ahead. However rule number 1 prevents that. Winner will be determined by votes in 3 weeks from now 24-02-2014 (dd-mm). 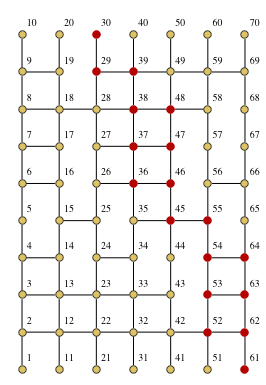 The 2D code generates a graph showing the path of the water. I displayed the vertex numbers for convenient cross-checking with the 3D display. Normally the vertex numbers would be hidden. Actually, the result contains multiple objects. The first object, result[], is the 2D graph shown here. The axes are displayed to help the reader convince herself that the 3D rendering is indeed based on the 2D rendering. The number or rows, columns and entry column are taken from the 2D code. 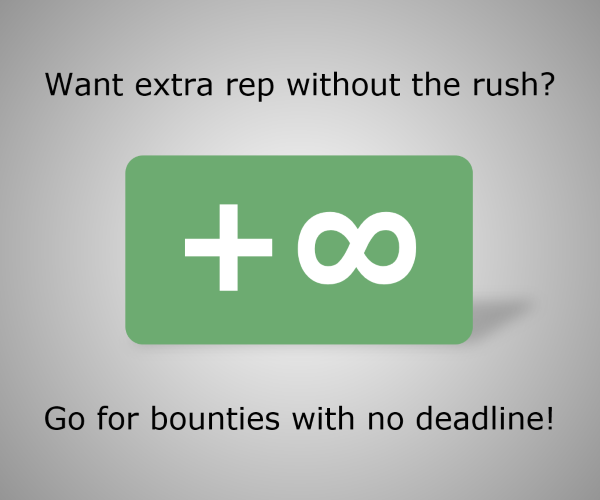 They do not have to be re-entered. In the coming days I will document and tidy up the code for 2D and 3D. Going to have to apply Equitable Stroke Control, as far as any golfing might go, but this is my approach in C# (well, LINQPad, but who wants all the boilerplate that goes into making a full C# app work?). 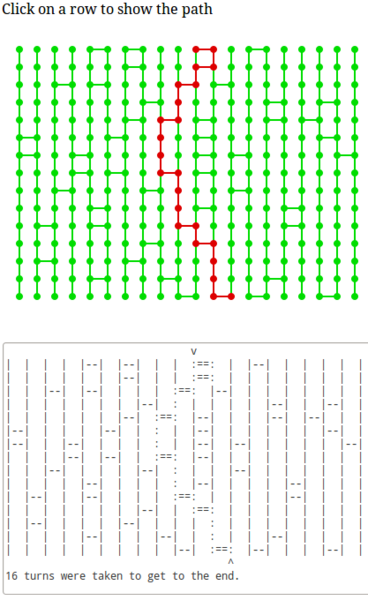 Grid definitions are variable, with a number of vertical pipes and height of overall structure, and are repeatably-random by passing a seed (see the PipeGrid constructor). In the absence of a definitive answer as to which way the object would flow if either direction was possible, I have allowed you to specify a behaviour from a number of options (see SolveBehavior enumeration / PipeSolver constructor). Starting vertical is definable (see PipeSolver.Solve). I have assumed that the horizontal pipes are always between two adjacent vertical pipes, i.e. no horizontal can bypass a horizontal pipe. "Failed to find distinct path, with no resolving behavior defined"
? path[x, y].HasValue ? ":"    : _grid[x, y] ? "|"    : " "
: path[x, y].HasValue ? "====" : _grid[x, y] ? " ----" : "    "
? _nodes[x, y] ? "|"    : " "
: _nodes[x, y] ? " ----" : "    "
Fearing my plain old text output might be a little drab for this popularity context, I offer up an extended version that also draws the path taken as an image. I've modelled it as car, driving through a horrible road network, trying to get to the bottom, but with the world's-worst GPS that forces you to make a turn at every junction. As a bonus, this also makes it clearer to see the 'turns'. 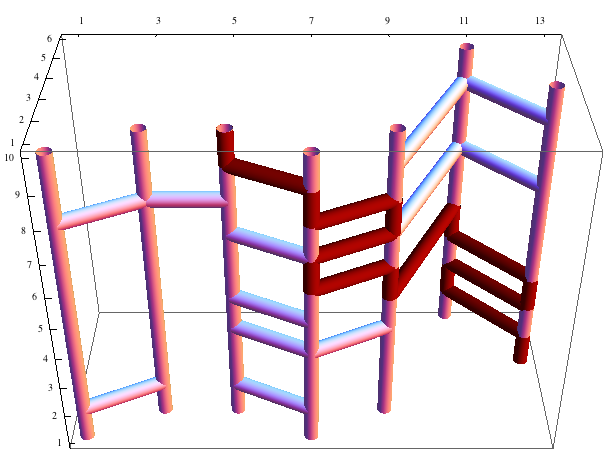 This code ensures there is at least some straight pipe at either end of each pipe. It also ensures there are no ambiguous turns. As if Funciton wasn’t already among the most pointless languages in the world, this is certainly the most useless program I’ve written in it so far. Since Funciton doesn’t have a random number generator, I decided to let you enter the pipe pattern. Since the pattern encoding is unobvious, banging the digit keys on your keyboard randomly is as good as a random number generator. The input is expected to be three decimal numbers separated by spaces. The first number is the width (one less than the number of vertical pipes); the second is the index of the starting pipe, and the last is any number that encodes the horizontal pipe pattern; you can make it as large as you want. If the width is negative or the pipe index is out of range, the output is Impossiburu. The program automatically ensures that there are never two horizontal pipes next to each other, which could cause ambiguous turns. The main program finds the first two spaces and splits out the numbers. It runs the third (the pipe pattern) through ░ and then calls ▒ with the result, which returns the output as well as the number of turns taken. It then adds the text n turns were taken to get to the end., where n is the number of turns calculated by ▒. ░ takes a number and inserts a 0-bit after every 1-bit, thus ensuring there are never two horizontal pipes in succession. ▒ generates the output by successively calling ▓ and then shifting out the right number of bits from the pipe pattern until it is zero. It also increments or decrements the “current pipe” appropriately. ▓ generates one line of the output. In each iteration, it shifts out one bit from the pipe pattern and then decides whether to output │ (+ 4 spaces), ║ (+ 4 spaces), ├────┤, ╔════╝ or ╚════╗; in the latter three cases, it removes the first character from the next iteration. The last iteration generates │\r\n or ║\r\n as appropriate. 10 turns were taken to get to the end. 0 turns were taken to get to the end. 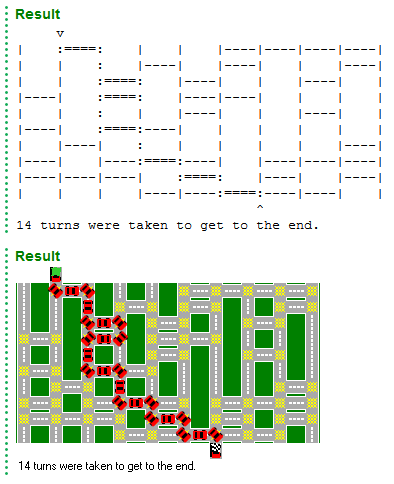 The HTML canvas listens for click events and finds the nearest row of pipes and uses that for the starting point. Output is drawn on the canvas and there is also a textarea containing the ASCII output defined by the OP. The algorithm will ensure that there are never two connecting horizontal pipes. Other than that restriction, a probability is defined in the initial variables and that is used to randomly determine whether a horizontal pipe should occur or not.